Imagine attending a workshop or a retreat, but instead of a conference center or event hall, you were surrounded by lush coastal rainforest, listening to the sounds of lapping waves of 80-degree calm Pacific gulf waters and roars of howler monkeys in the jungle. This is what it is like to have a retreat or seminar at Playa Nicuesa Rainforest Lodge in Costa Rica. The remote oceanfront jungle lodge on a 165-acre private reserve in southern Costa Rica is a unique and exotic location to organize relaxing and private retreats. 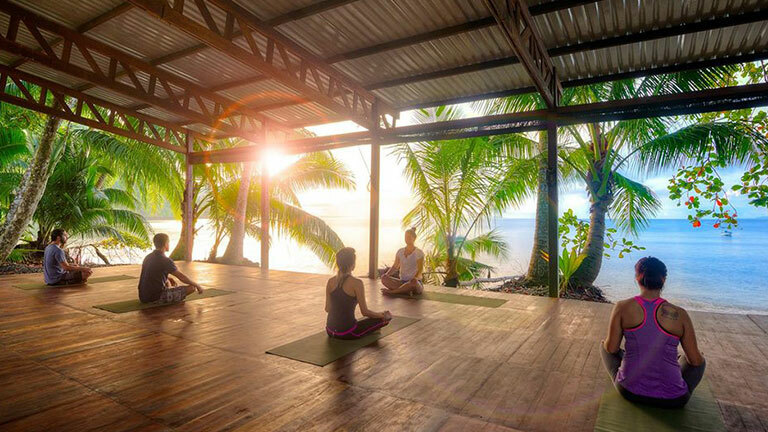 From conferences with scientific guest lecturers to yoga retreats, family reunions to company meetings, Playa Nicuesa Rainforest Lodge is ideal for small group getaways. Groups of 18-28 persons can take the entire lodge for a completely private event; or smaller groups can share the lodge with other guests and still have private meeting and gathering space. Accessible only by boat, Playa Nicuesa is situated on the breathtaking Golfo Dulce (â€œSweet Gulfâ€), one of only a handful of unique tropical fjords in the world. The renowned Osa Peninsula is just across these placid Pacific Ocean waters from the lodge. Their protected reserve joins into the Piedras Blancas National Park. The undeveloped and pristine haven embraces conservation and harmony with nature. Electric is powered by solar panel generators and fresh water bubbles in from a natural spring. Playa Nicuesaâ€™s beautiful and specially-designed 3,000-square-foot main lodge building â€" described by some to be like Robinson Crusoeâ€™s tree house â€" was built all with sustainable materials and houses an open-air bar, dining room and lounge areas. One-of-a-kind â€œjungle-chicâ€ accommodations in five private bungalows and a separate four-room two-story guest house all have private open-air bathrooms with hot water showers, canopy queen beds, hardwood floors, ceiling fans and private terraces. Fresh meals are included in all stays. There is a spacious yoga deck by the beach and a canopy-level yoga platform in the main lodge building. Yoga classes are given daily in the early morning and late afternoon. To complement any retreat or seminar program, there are plenty of adventure tours: rainforest hikes on private trails to a waterfall, bird-watching, kayaking and snorkeling on the Golfo Dulce, a botanic garden tour, fishing, a jungle river tour by boat or kayak, and more. Abundant wildlife in the area includes three types of monkeys, coatis, agoutis, crocodiles, Scarlet Macaws, toucans and other tropical birds. For more information on holding a retreat, seminar or group event at Playa Nicuesa Rainforest Lodge, check here.